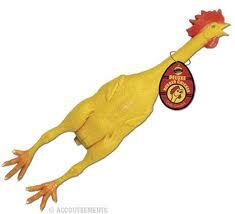 BREAKING NEWS: Price Of Rubber Chickens On The Rise! If you think gas is expensive, try pricing rubber chickens. Humor consultant Malcolm Kushner has tallied the Cost of Laughing Index since 1987, and he says the wholesale price of a dozen rubber chickens is up 8% since last year, from $72 to $78. On a bright note, the price of Whoopi cushions is holding steady at $1.20 a dozen. - The cost to ABC of actually having Whoopi Goldberg sit on the cushions on the set of “The View” continues to rise.